A West Coast Berbice man succumbed early Wednesday morning to injuries he sustained in a mystery fire that flattened his two-storey wooden house at Bush Lot Village . 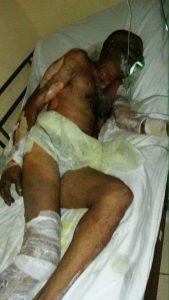 Jaikarran Sahadeo, 59, of Lot 99, Section D, Bush Lot Village, West Coast Berbice, who sustained third degree burns about his body succumbed sometime after 9 p.m. on Thursday evening at the Georgetown Public Hospital. The fire reportedly started in the lower flat of the man’s home. Sister of the injured man, Indira Sahadeo, who also resided at the home, told Demerara Waves Online that she was not at home at the time of the fire, but at around 12:30 pm on Tuesday evening, she was alerted to the fire by neighbours. Jaikaran Sahadeo succumbed to his injuries on Thursday, October 12.